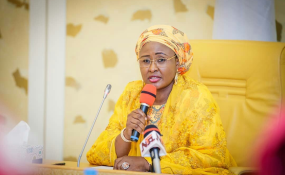 In an unprecedented move, a parallel campaign structure put in place by the wife of President Muhammadu Buhari, Aisha, is scheduled to be inaugurated today (Thursday). While some APC supporters express fears that having two different campaign councils might lead to a clash or that Mrs Buhari has no confidence on the council earlier released, the spokesperson of Mr Buhari's campaign, Festus Keyamo, said there is no cause for concern. "It is just an expanded part of the campaign. It only shows the commitment of the wife of the president to work for the success of the president and we will work together very well," he told PREMIUM TIMES. The president's wife had in an interview with the BBC in 2016, threatened to withdraw support for her husband if he chose to seek re-election unless he shakes up his cabinet and includes more people who worked for his success in 2015. Mrs Buhari said although the victory of the APC in 2015 "was a collective effort of millions of people" she was unhappy hat "... the government is being operated by a few people". Also, while addressing a gathering of APC women in Abuja recently, Mrs Buhari accused Nigerian men of allowing two or three unnamed persons to "cage" her husband, thereby limiting his ability to perform to the expectation of millions who voted him into office. Although Mrs Buhari did not name the persons who 'caged' her husband, she is believed to have been referring to Mr Buhari's influential relative, Mamman Daura; and his chief of staff, Abba Kyari. The first lady has had no love lost for both men since her husband assumed office. Another of Mrs Buhari's major grouse with her husband's administration and party, APC, was the handling of the APC primaries including the loss her brother suffered in the Adamawa governorship primaries. "All Progressives Congress being a party whose cardinal principle is change and headed by a comrade/ activist whose main concern is for the common man, yet, such impunity could take place under its watch," the president's wife wrote on her official Instagram page. "Given this development one will not hesitate than DISSOCIATE from such unfairness, be neutral and speak for the voiceless," she said. It is not clear how much Mrs Buhari's anger at the APC leadership influenced her decision to form her own campaign committee. However, a source close to her said Mrs Buhari's decision to set up a separate campaign team stems from her fear that the main presidential campaign council may not pay needed attention to the youth and women who constitute the larger majority of voters in Nigeria. "While the main team will focus on campaign rallies full blast, the team headed by the wife of the president will deliberately target young persons and especially women. At the end of the day, we will not miss out on sending the NEXT LEVEL message to all and sundry," the source said, asking not to be named as he was not authorised to speak on the matter. See the full list of the campaign team here.